An epic clash ten books in the making! Worlds collide as the Hunter and Ilanna face off in a battle for the city of Praamis. 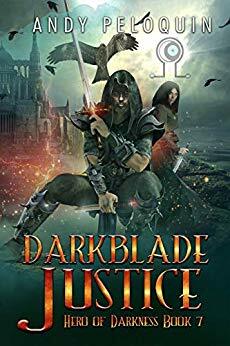 If you enjoy thrilling murder mysteries and pulse-pounding sword and sorcery, you’ll LOVE Darkblade Justice. Prepare for total immersion in the dark underground and grim streets of Andy Peloquin’s epic fantasy world! Action, fear, anger, remorse, rage, and gut wrenching pain, and then, yet more unrelenting action.– R.W. Excellent characters combined with great world building make this a can't miss series for fantasy lovers. — S.C. This book brings two of my favourite characters together to solve the murders of children in Paramis . The Hunter following a demon hiding in human form . He heads to Paramis to find out who is behind the slayings . When he runs into Illana and the Night Guild . Both of them trying to find out who is killing the young children and why . Between the demons and the Duke that is really eager to blame this all on the Night Guild . Will they find out and bring the killer to justice . Before they kill each other . This book was the book that I was waiting for . The Hunter and Illana in the same book , yes. I so love the Hunter , he is the personification of a true hunting machine is . He is logical and methodical and relentless in the pursuit of those that are evil . But we also get to see a more human side of him and a side that is actually really fun . You will really like him in this book and if you liked him before you will really like him in this book . Now lets talk Illana , she is amazing in this book . She is tough and won't back down from anyone . Even the Duke who wants her dead and the Night guild stopped . She doesn't take any bull from anyone , She is such a strong female character that you will fall in love with , We also see her try and balance being a mom and running the night guild . Which is harder then you think. We also get to see Koydn all grown up and wanting to help . This book is EPIC yes I said it . I have loved all the books in both series so when I heard the author was going to combine both worlds . Yes I admit it I did a happy dance . When I got the book I sat down and read it in a day and a bit . I couldn't put the book down . I really liked how the author combined both worlds into one story. And kept each character getting equal time one character didn't over shadow the other character at all . He had them both working different angles on the same murder . They are both powerful characters that work really well together and the author balanced them very well . This is a fast read if you love epic fantasies . The author really takes us on a thrill ride , you need to sit down and buckle up and enjoy the ride . If you want to know more about the characters I would say read each of their series . Trust me though you will not be disappointed in the least . You will fall in love with the characters .